Description: Descriptions of transient behaviors are offered in an asynchronous engine which lets to set new conformities to the law of starting process and to offer the method of diminishing of sizes of shocks currents. 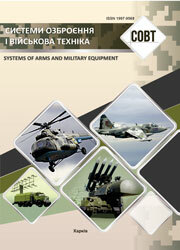 Panchenko, A.M. (2006), “Perekhidni protsesy v zahalmovanomu asynkhronnomu dvyhuni”, Systems of Arms and Military Equipment, No. 1(5), pp. 55-58.